Ricky Carmichael has continued a dominant start to the THQ World Supercross Grand Prix Series with a second consecutive win at the second round in Vancouver. 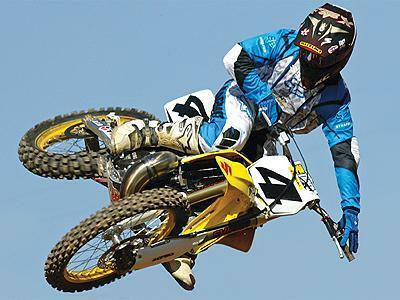 Carmichael made the best of a tricky track at the B.C. Place Stadium in Canada, passing early leader Kyle Lewis by the second lap of the 20-lap 250cc final. He took the chequered flag 25 seconds ahead of Honda's Nick Wey, who had moved up from sixth place to finish just ahead of fellow Honda rider Damon Huffman. Mike LaRocco took fourth. 1) Carmichael. 2) Wey. 3) Huffman. 4) LaRocco. 5) Voss. 6) Thomas. 7) Evans. 8) Lewis. 9) Hansen. 10) Vallejo. 11) Hamblin. 12) Johnson.I. 13) Buckelew. 14) Siebler. 15) Povolny. 16) Wilson. 17) Ferry. 18) Mason. 19) Gibson. 20) Johnson.K.